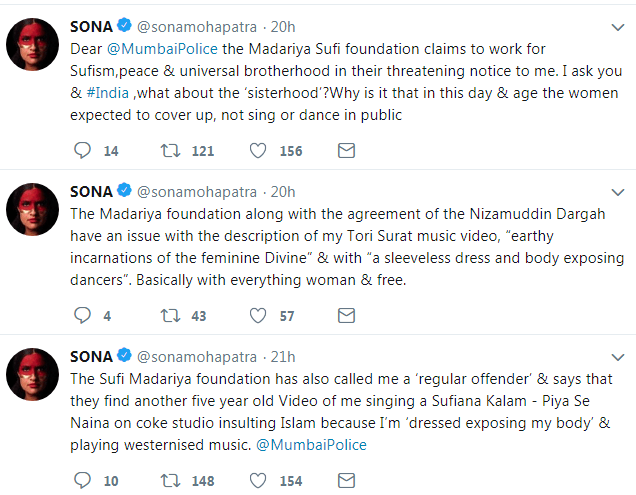 Singer Sona Mohapatra had yesterday claimed that she has received a threating email from the Madariya Sufi Foundation asking her to remove her latest music video from all communication mediums. The Singer added in a series of tweets that the said foundation is calling her video vulgar and claiming that it will incite communal tensions. The singer further tweeted that she had been called a ‘regular offender’ by the organisation and told her that in one of her older videos she was insulting Islam as she was ‘exposing her body’ and playing westernised music. She added that the foundation, along with the Nizamuddin Dargah has an issue with her recent video ‘Tori Surat’ alleging that they find it offensive because she is seen in the video wearing a sleeveless dress accompanied by dancers who were ‘body exposing’ according to the threat notice. The Mumbai Police, taking cognisance of her tweet had offered help to the singer. The singer was asked details and was advised to visit the nearest police station to lodge a formal complaint. Sona Later tweeted to express her thanks for the help and assistance provided by Mumbai Police to her. Many artists of Bollywood and social media users have condemned the threats allegedly issued to her and have expressed solidarity for the singer. Threats to singers and artists in Bollywood over their work or statements are not new. Earlier, singer Sonu Nigam had faced several threats of violence and humiliation for slamming the use of loudspeakers during Azaan.